This weekend I saw a Fox 6 feature story about Crafting Banjos that was Absolutely Alabama. It first caught my attention because it was about Alabama music, then it grabbed my attention because it included Jason Burns. Then I started to do a little research about Jason for MusicSceneAL and quickly found that he is a bigger celebrity than I had known. I know first hand that he does good work and I often sing his praises. 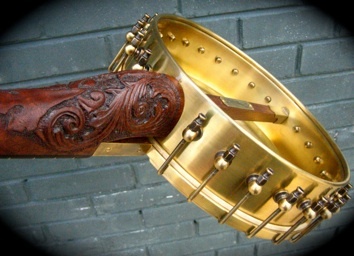 This article on BanjoHangout.org is about “The Finest Open-back Banjo That I Have Ever Touched”! And here’s a YouTube Video of one of Jason’s creations showing the look and the sound. My point being that if you google “Jason Burns Banjo”, you’ll find lots of praise for Jason’s craftsmanship. You’ll find Jason at Homewood Music and you can learn more about him at his website.